The St. Augustine Cottage Chest will add immediate interest level to any room. 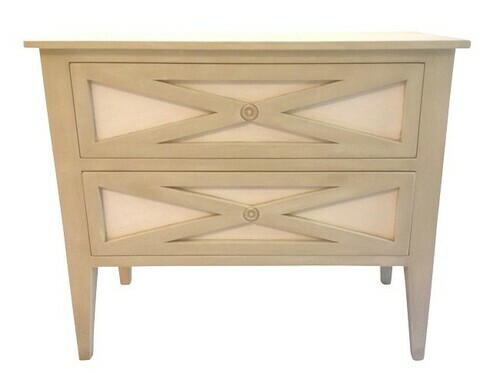 The Classic "X" design with antiqued mirror give this chest a nice transitional feel that can be used in many settings. Chest Drawers are available with either Mirror or Wood Panels. Shown here with wood panels and with a Sandstone finish and Antique White Panels. Custom made for you from 100% wood, typically mahogany. Features dove-tailed, self-closing full extension under mount drawer glides. Measures 42"W x 36"H x 20"D.